I love it when stuff happens that makes you go ‘Ah ha!’ Those moments where the light goes on, something so simple dawns on you or you get a little prod from the Universe that brings you right back to where you need to be. And this week, I have had many of these reminders about coming back to my inner happy and not allowing a negative train of thought or a fear steal away my happiness. Finding happiness is one thing; keeping hold of it is another. And in this blog, I wanted to share how easy it is to be distracted away from the happiness centre within us and how to come back to it. I have been doing a lot of business development work in the last month; getting my website built and starting to learn about this new digital marketing malarky. And I’ll be honest with you – I have struggled. Coming from a corporate world, where I was able to win customers through my reputation, build strong relationships face to face and connect with people in person – moving into a virtual world has been challenging. It’s not beyond me, although it’s a steep learning curve and a big shift for me. And so I have immersed myself in learning how to operate in this new space and earlier this week, I experienced a trigger that sent me reeling into a familiar, dark place. A bit of constructive feedback from someone about a product I had been nurturing for weeks, had me crumbled. Boom! The old fears and pre-texts suddenly arose from the shadowy depths of somewhere I’d rather not go again and my old friend Doubt came a-knocking and before you could say, ‘how’s your father?’ I felt overwhelmed, saturated and confused. I’ve been in this place before, although now with a stronger self-awareness, I was able to recognise the signs – me being grumpy, heart racing and agitated – and I took charge immediately. I stepped back from all my activity and grounded myself in nature. I took time away from the learning, put down my devises and allowed myself some ‘me’ time. I came back to my heart and stopped the insatiable ego running a-muck in my head and within a day I was back to it. I allowed myself to surrender and take care of my needs and soon I was back to my inner happy state. So what is the lesson? Noticing when you’re not feeling happy is key to being happier. Whilst it might sound flippin obvious, learning to spot your signs and triggers for suffering is one sure step towards reconnecting with your happiness. The second awakening I had this week, came on a walk with my hubby, Myles. We’re currently in Italy – Tuscany to be precise and we found a great place to stay, right by the beach, in a bay protected by islands. There was a stunning village called Talamone about 3km away which we took a walk to during Italy’s All Saint’s Bank Holiday. Armed with my partner in crime – my trusted camera, I soon started clicking away, always looking for that perfect shot. Although having exhausted my pixels, on the way back, with said camera safely packed away in its bag, I started to really notice what was around me. 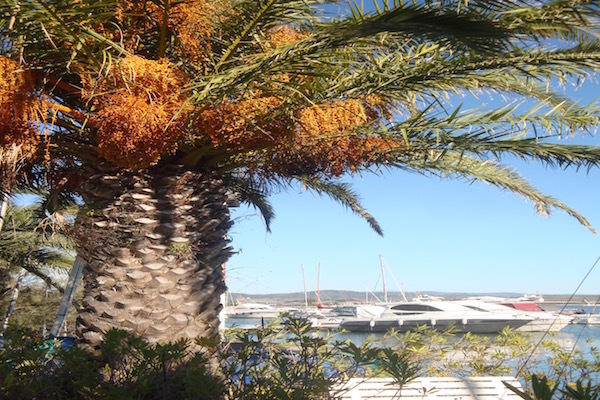 I was shocked to see the most amazing display of orange berries on a palm tree by the marina – and they were profuse, dripping berries from every branch. It was stunning. Yet what struck me was how I had missed this sight on the way into town. I was so focused on finding the perfect shot that I missed the perfection right in front of me. And my lesson? Instead of looking, see. Instead of listening, hear and instead of thinking, be. So often the very thing we seek is already there, we just need to stop being distracted to see the real beauty. Our egos block so much of our happiness. My ego was looking for the perfect shot and I missed the very thing I sought. Sometimes we just need to put down our tools and experience the present moment, as it has all the joy and peace that we long for. My third lesson of the week actually leads on from the first. In my stepping back and self-care moment, I got an amazing piece of clarity. I know it came from my heart and not my head because it went – Bosh! There was no thought process, no analysis, no problem-solving, no judgement. Just a pure piece of Boom – a knowingness that something is right. My confusion was how best to get my message across – is it social media, is it my website, is it advertising? And then there it was. What is it that I love to do most in my ‘new, non-corporate’ place? I love to write. I love how words can influence someone, entertain or inform. I love how they flow through my heart to the keyboard to the blog page. It just flows. So why not get my message across in blogs and articles, like this? And there it was, my ‘Ah ha’ moment. Of course! So with renewed vigour, I have begun writing again and finalising my latest book ‘Happiness in Your Hands’ so I can present it to a publisher early in the new year. And how would I summarise this third lesson of the week? Do what you love, or love what you do. It is that simple. It is only our minds that thinks it should be more complicated. When we take time to step back from the mayhem in our minds, the voice of our intuition or heart becomes so much clearer. Take space to be still and in the silence the answer comes. 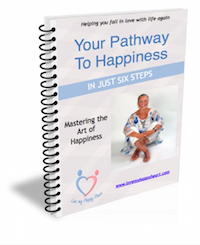 So I hope that my insights and happiness lessons may give you some inspiration to find your inner happy and keep connecting to it on a daily basis. Our happiness is in our control – every minute of every day and noticing when our happiness has been stolen by our ego is so important if we want to feel more peace, more often.